This handout adds an intersectional lens to the Gender Box activity. We all can contribute to the movement to end relationship abuse and sexual violence. At the individual, community, and policy level, there are ways for everyone to get involved. Together we can make an impact and move towards prevention. Prevention starts with having a conversation. As caring adults, both professional and personal, talking about relationship abuse and sexual violence may feel uncomfortable. 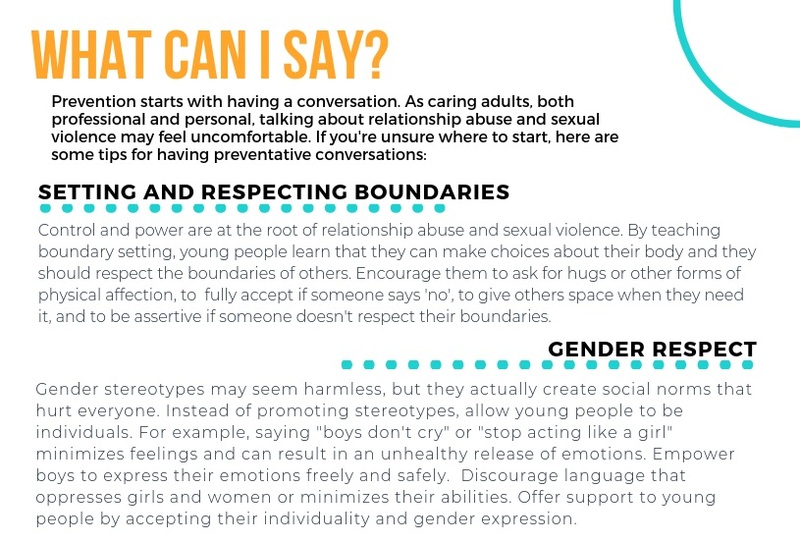 If you're unsure where to start, here are some tips for having preventative conversations. Want to use music lyric analysis in your workshops? Check out this list of relationship songs! What message is the song sending? Where does this song fall on the relationship spectrum? What lyrics stand out to you? How would you change the unhealthy lyrics to healthy lyrics? It’s important to remind young people that you aren’t dismissing the songs they like. They can still enjoy a song, but it’s more important that they are able to analyze what they hear and imagine how the lyrics would look if they were played out in a relationship. Have songs that you like to use for music literacy? Please email them to tonjie@eleven-24.org and they can be added to the playlist! Here are books that can enhance prevention programming and start conversations. To learn more about the books and how they can be used, subscribe to the eleven24 newsletter. This children's book explores finding your identity and being one's true self. This children's story teaches about empathy and how to be supportive. This young adult novel follows a boy who's friend is being sexually assaulted. All images are downloadable. Feel free to use these social media posts and don’t forget to tag @_eleven24!